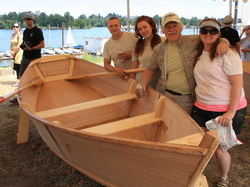 This will be our second year of hosting the Family Boat Build as part of the Wooden Boat Festival at Willamette Sailing Club. It will be held July 9-10, in conjunction with WSC and the Oregon Maritime Museum. We will be able to support 10 families this year. A gallery of photos is here.